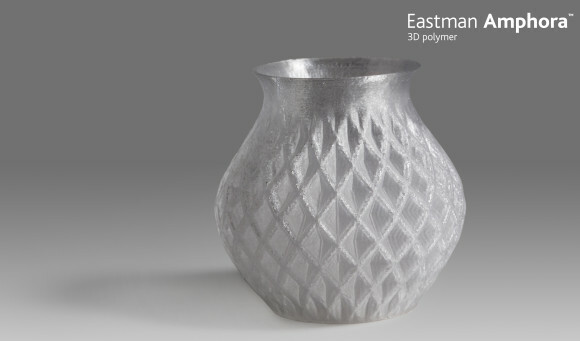 At London 3D Printshow, US-based Eastman Chemical Company introduced Amphora 3D, a new plastic polymer specifically designed to generate 3D printing filaments. Today, in most cases, deposition 3D printers use ABS or PLA- based filaments, but both ABS and PLA were designed with other applications in mind and have their limits in 3D printing. That's why Eastman Chemical and ColorFabb last year started a joint research project to create a new plastic material with the best properties for deposition 3D printing. The resulting polymer has been called Amphora 3D and is already available as a commercial product: XT-Copolyester spools by ColorFabb. Amphora 3D is stronger than ABS and PLA and its printed layers bond together better, so it's possible to print objects with finer details and the final result is more solid. The new polymer is also safer than ABS because is styrene-free, has no BPA and emits much less nano-particles when melting. Amphora 3D shows a strong chemical resistance and it's been approved by FDA for "food contact" objects: this does not mean that is completely and officially food-safe, but certifies that an Amphora-based object will not be a source of toxic contaminations caused by degeneration of the material is made of.